When she couldn’t feed all of her seven children in rural Ohio in the 1860s, twice-widowed Quaker Susan Wise sent two of them to live in a poor house. 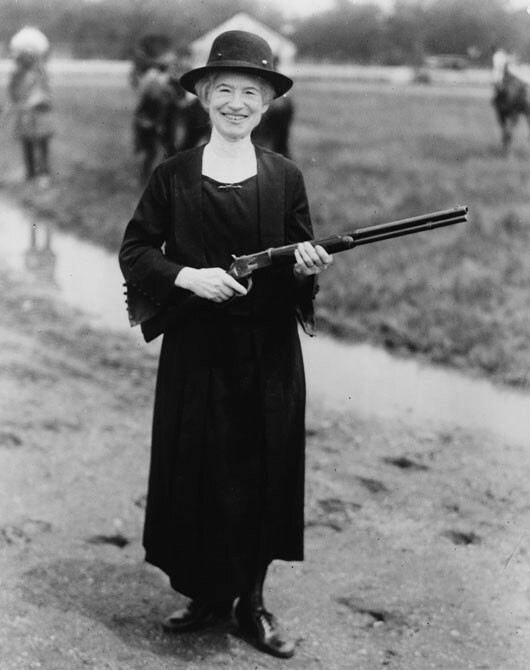 One of the children, Phoebe Ann Moses—better known as Annie Oakley—was loaned out to a family who beat and neglected her until she ran away two years later. Not one to hold a grudge, she returned to her mother’s home at age 15, bringing offerings from her own animal traps to the dinner table. There she honed her famous sharpshooting skills and paid off her mother’s mortgage by selling game to restaurants. Then she ran off to join Buffalo Bill's Wild West show as their star exhibition sharp-shooter, where she met her match, competitor Frank E. Butler, and married him. Later her life was made famous in the musical Annie Get Your Gun.